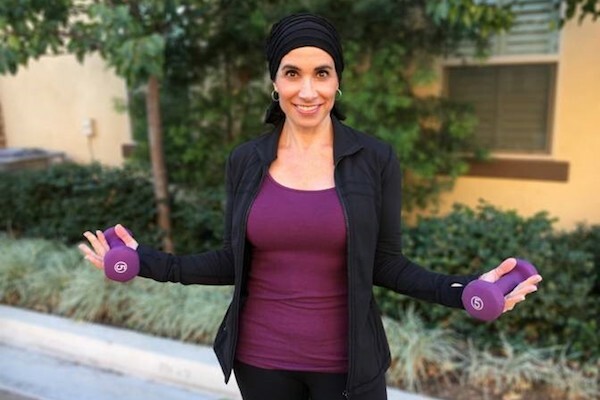 She missed a year of normal life due to cancer, but Tammy Salamone didn't lose her momentum as an American Council on Exercise (ACE)—certified personal trainer or avid exercise devotee. The married mother of three from Yorba Linda, California, was diagnosed with breast cancer in January 2017. She ultimately underwent a double mastectomy and then reconstructive surgery. "I exercised six days a week before this happened and I continued with that, even on chemo days," Salamone, age 49, told HealthCentral in a telephone interview. Some days were treadmill walking, plus she started lifting very light weights when her doctor said it was okay to do so. "Starting in July 2017, I had 12 weeks of chemo with Taxol, along with Herceptin, a drug to target HER2+ cancer cells, every three weeks. I continue with the Herceptin infusions every three weeks until July 2018." During initial chemo she ran up to two miles a day. "My oncologist said, 'You're doing great! Keep doing what you're doing.' My plastic surgeon was most conservative, warning me to 'take it slow.' He was so encouraged when he saw me at four weeks after my second surgery and said, 'What's it been, 11 or 12 weeks now?'" She modified planks and push-ups when she was cleared to do them, and just tried "to keep my body moving and blood flowing." Salamone is certain exercise helped her recover more quickly from her entire ordeal. "The oncology nurses even said my veins were good for an IV (for chemo delivery) because I work out," she says. "Otherwise, a port would have been surgically implanted in my chest for a year." More than 14,700,000 people have cancer in the United States and many like to exercise. They - and you, even if you don't have cancer - have plenty of great reasons to do just that. According to the National Cancer Institute (NCI), being sedentary raises risk for not only cancer, but other chronic conditions such as heart disease and type 2 diabetes. Additionally, burning fewer calories is a fast track to obesity linked to increased risk of 13 different cancers. Cancer doesn't have to mean resting and being physically inactive. For anyone committed to their workout program, that's a hard pill to swallow. It's encouraging that, as researchers and clinicians have realized and documented, exercise that's carefully monitored really can be "good for you." The American Institute for Cancer Research (AICR) says it's a "safe and powerful tool to improve health and quality of life of cancer patients." At the American College of Sports Medicine (ACSM), the association's guideline champions physical activity even if a person is in treatment, urging you to be as physically active as your abilities and conditions allow. As to how much, consider the recommendation for all of us: 150 minutes a week of moderate intensity aerobic exercise, with muscle training and flexibility work. As the college notes, if you weren't working out before you were diagnosed, easy does it. Consider starting with walking and continue measured progress over time. Stay in touch with your healthcare team since everyone is different and one exercise program does not fit all. Your diagnosis, treatment protocol, age and fitness level all matter. A 2016 ACSM report called "Exercise During Cancer Treatment" advises that, in addition to getting oncologist approval, you monitor vital signs regularly. Don't work out alone and don't use public fitness facilities such as swimming pools because of the risk of exposure to infection. Avoid swimming if you have a catheter. Obviously, stop your exercise if you become disoriented, dizzy, nauseated, or if you have shortness of breath, irregular heart beat or chest pain, or unusual pain elsewhere in your body. Muscle cramps or muscular weakness and fatigue are also signs to regroup. The college recommends that anyone undergoing cancer treatment allow for "down" days or reduced levels of activity, depending upon effects of chemotherapy, biological therapy, or radiation therapy. Thankfully, as attitudes change thanks to evidence-based findings, "that was then, and this is now." A new exercise program targets the issues and challenges that people with cancer, and cancer survivors, face as a unique population. From ACE, it's the Cancer Exercise Specialist Program from cancer survivor Andrea Leonard, who's also the founder and president of the Cancer Exercise Institute. The program is well-honed after 23 years in development. If you're used to working with a trainer at your gym, you might have found it difficult to train with someone who couldn't understand your specific needs as a patient or survivor. Now you can find that person to help you stay your fitness course, even with cancer. Ask your gym, your YMCA/YWCA, or other training facility to connect you with a cancer exercise specialist.